Shoulder N/A 14" 15" 15" 15.5"
Bust N/A 33" 33.5" 36.5" 37.5"
Length N/A 36.5" 36.5" 36.5" 37"
This elegant women’s satin dress is a classic example of high fashion. It is constructed from a high quality, heavy duty satin fabric that shimmers in the light. The dress features a vee neckline and flattering crisscross bodice. 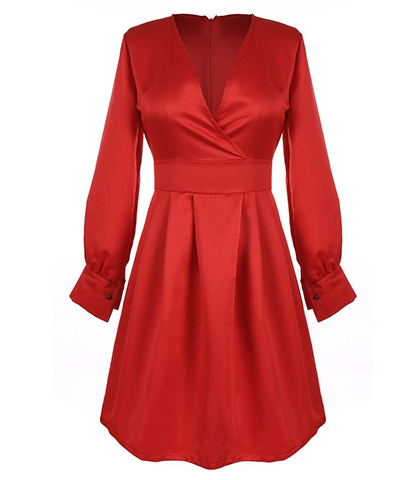 It comes in a beautiful shade of red and has long sleeves. Wide cuffs grace the ends of the sleeves. The waistband is clearly defined. The skirt has gentle gathers that provide a moderate amount of fullness. We recommend dry cleaning only for this garment. It zips in back with a long, concealed zipper. This dress is available for purchase in sizes Small, Medium, Large and Extra Large.